Valid 26 January to 3 October 2019: Book and pay for 3 nights and get an additional night free (stay 4 nights). 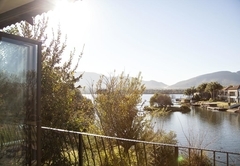 Rivendell is a highly recommended Hartbeespoort Bed & Breakfast providing accommodation in 4 guest rooms for tourists visiting the Hartbeespoort Dam region. 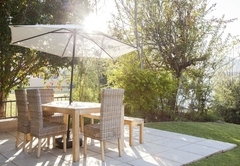 Rivendell offers accommodation for families wanting to get away for a relaxing break. 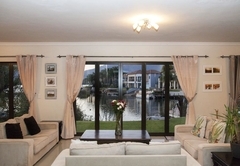 Rivendell is a new water front property, at one of Hartebeespoort's most exclusive estates where gemsbok, nyala, springbok and many more roam freely. There are four B&B bedrooms which can be booked individually, alternatively you can hire out the whole house on a self catering basis. 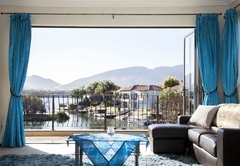 The three bedrooms (Orange, Blue and Red) upstairs have large folding doors over looking the dam and mountains, King-size beds and full en-suite bathrooms. 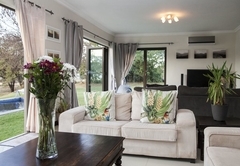 There is a flat screen TV with DVD player and DStv in each bedroom upstairs. For adults travelling with kids, there is a kids room downstairs with a bunk bed and two singles that is available on request at an additional charge and sleeps a maximum of 4 children. 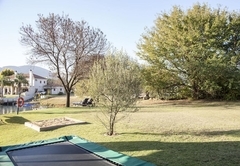 Outside there is a swimming pool, sand pit and braai area. The estate is very secure with 24 hour patrols and is access controlled. For the kids there are safe roads to ride bicycles and playgrounds with an enclosed swimming pool. There is also a mashie golf course, mountain bike tracks and volley ball court. There is an abundance of wildlife on the estate including baby gemsbok and a rare black springbok. Other activities include fishing and birding. The area surrounding the dam offers much entertainment; there is walking with elephants, cable cars, Monkey Valley, quad biking, go karting, archery, De Wildt Cheetah Farm and hot air ballooning. A speedboat for cruising or tubing can be organised. 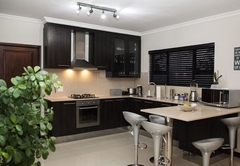 The house is suited to families looking for a quiet breakaway. 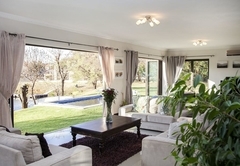 4 Bedroom house: The three bedrooms upstairs have large folding doors over looking the dam and mountains, king size beds, sleeper couches for small children and full en-suite bathrooms. 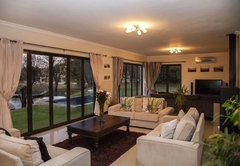 There is a flat screen TV with DVD player and DSTV in each bedroom upstairs. The childrens room downstairs has a bunkbed and two singles. There is a separate maids room and a camp cot is also available. 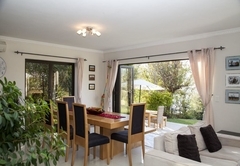 This room has large folding doors over looking the dam and mountains, a King-size bed and full en-suite bathroom. 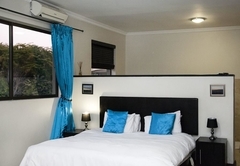 There is a flat screen TV with DVD player and DStv in each bedroom upstairs. 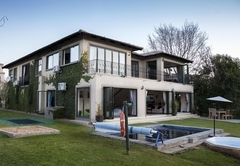 Loved the beautiful house and its views. A home away from home! We are definitely going back to Rivendell. A wonderful place to be, we had a great time. The house is so beautiful, me and my family were so impressed.